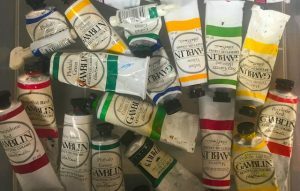 I use only Gamblin oil paints, mediums and solvents, which are all locally made in SE Portland. I strive to create paintings whose production has as little impact on the environment and my body as possible. 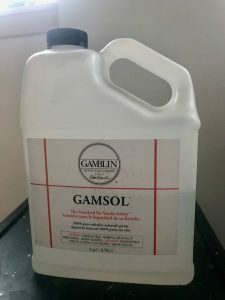 A key component is the use of Gamsol, a low odor mineral spirit solvent produced by Gamblin. Gamsol is the only solvent I use. The removal of turpentine and painting mediums containing dammar resin varnish has produced a studio with low toxicity. I reuse and recycle Gamsol according to Gamblin guidelines.